The new Audi A5 has been a long time coming. Nine years in fact, which in the modern automotive world is a lifetime. Yet it goes to show how popular the A5 has proved that even in its final year on sale, it’s proving as big a seller as ever. However, there’s no doubting that a new model is overdue, especially given how good newer alternatives like the BMW 4 Series and recently launched Mercedes-Benz C-Class are. Audi is very keen that the A5 is seen as more than merely a two-door version of the A4. Which is why this new model gets a more distinctive look than its saloon counterpart. It still retains that familiar A5 profile but gets a more aggressive front end with a long bonnet complete with sculpted lines. The result is a good looking coupe. But perhaps the biggest change from the old car is found inside. After almost a decade on sale, it’s no surprise that the interior of the outgoing A5 was starting to shows its age. But this latest model is bang up to date. The quality of the finish has been upped and there are some lovely design features like the neat gear lever and floating infotainment screen. What the A5 does so well is get the key elements right. The driving position is spot on, all the buttons and switches are wonderfully tactile and there’s high quality leather on all the key points you come into contact with. There’s also more space - particularly head and shoulder room - and a slightly bigger boot too, now 465 litres, which is more than the BMW and Mercedes-Benz rivals. The other big change is refinement. The new A5 is far quieter and smoother on the move than the old one. Much of that is down to improved aerodynamics with better sound insulation, along with newly developed front and rear suspension. The engine is near silent and even S line models on big 20-inch wheels are comfortable over rough roads. It’s perhaps here where the A5 feels a big step up from the original. That's not to say it's soft in corners. The A5 manages to blend ride and handling very well, with nicely weighted steering and plenty of composure in corners. It will effortlessly deal with a series of tight bends and there's lots of front end grip plus decent traction, even in this front wheel drive variant. What it does so well is insulate the cabin from bumps and potholes in the road, so you can make smooth yet quick progress even on poor quality surfaces. The A5 weighs less than before, around 60kg to be precise, thanks to a lighter body shell, which benefits both the handling and fuel economy. So while the 2.0 TDI now has more power than before with 190PS it’s actually more economical, returning 68.9mpg according to the official figures. Although as Real MPG for the A4 Avant shows, mid 40s is more likely to be a realistic figure. The 2.0 TDI also gets a revamped version of the six-speed manual gearbox but our choice would be the seven-speed S tronic automatic which you can get with front-wheel drive for the first time, replacing the multitronic CVT of the previous model. The S tronic has been tweaked with revised gearshifts and the result is a big improvement. We've often criticised the twin clutch gearbox for being hesitant and indecisive, but the changes have eliminated those problems, making this the smooth and quick shifting gearbox you'd expect from Audi. Of course this being an Audi there are also plenty of toys inside. Our favourite is the Audi Virtual Cockpit which is a fancy name for a big colour screen which replaces the conventional dials. It may seem like a gimmick but there’s no denying it’s an impressive bit of kit. The fact you can have the full navigation map display in front of you is really handy. Our only criticism is that sometimes it can be a case of information overload. Oh and of course it’s optional across the range, with an expected cost of around £450 - not even the top S5 models get it as standard. That said, standard equipment is pretty good. The entry-level SE model comes with 17-inch wheels, three-zone climate control, keyless start, rear parking sensors, cruise control and MMI Radio Plus along with Audi drive select. Go for a Sport and you get navigation and sports seats while the S line gets things like the Knight Rider-esque dynamic indicators, lowered sports suspension and 18-inch alloys. With prices expected to start at around £30,000, the A5 will go head to head with the 4 Series and C-Class Coupe when it goes on sale in August. The BMW and Mercedes-Benz are mightily good but for those who demand the best refinement and quality, the Audi A5 is hard to beat. 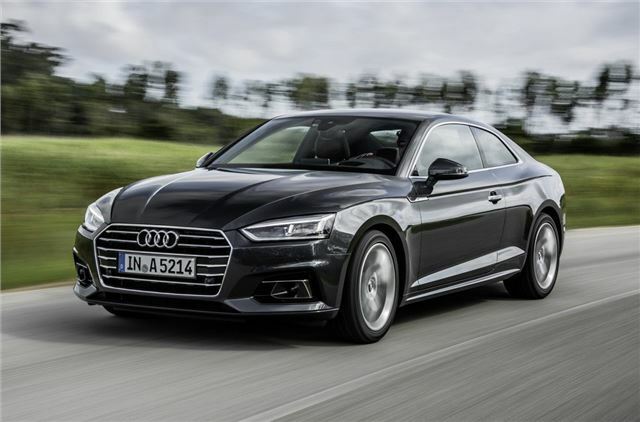 The Audi A5 will go on sale in August with the first cars arriving in November.